Happy to hear that an article Mél Millette and I co-authored has been published today, in the journal of Social Media + Society. 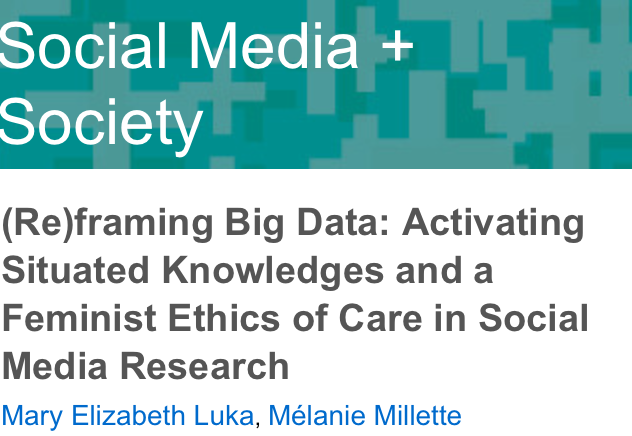 It’s titled (Re)framing Big Data: Activating Situated Knowledges and a Feminist Ethics of Care in Social Media Research. We look at some of our own recent research in social media, ask crucial questions about how we can make participation easier and more relevant to the groups of people we involve and research. It’s one of several great articles in a special issue on ethics and social media. DOI: 10.1177/2056305118768297. SM+S issue 2 of 2018. What right do we have to be on this terrain? From which stance or positionality do we undertake our research and with which privileges and vulnerabilities? Are we participants as well as researchers? In what ways? How can this research be collaborative and useful for the person(s) whose experiences are being scrutinized? In what ways and to what degree are we comfortable inviting members of the communities involved to collaborate on research design? What if they aren’t interested in explicit participation? How do we provide implicit decision-making opportunities through which participants can be involved? If they accept the opportunity (and responsibility) to work with us on research design, how do we resolve any conflicts or disagreements? To what degree are we prepared to rethink our research plans and repurpose it to align with their agenda and needs? How can we make our proposals to collect data visible to those whose work we wish to collect? danah boyd and Kate Crawford (2011) rightly insist that so-called “public” tweets, posts, and snaps are not research-ready; they were not originally meant to be research material—How can we help participants and other researchers to understand this and promote informed consent in that process? How can we advance debate about issues of privacy and personal data ownership in a social media context? In a connected world where Google, Amazon, Facebook, and Apple (GAFA) form an oligopoly that largely dominates global data management in Western societies, how can we, as educators and theorists, take action? Are there workshops, alternative platforms or other processes that we can support and demonstrate through our research? How do we disseminate the results in a respectful and useful way? If we are required to publish in journals for peers, how can we make this meaningful for the people whose involvement has contributed to these results? What are the other forms of reporting back, providing joint attribution or other analyses or descriptive expressions that we could commit to and involve participants in? Is a written format the best way, perhaps in a blog or newspaper? Would they prefer to be involved in an oral discussion (Online? In person?) A workshop? A collective art piece? How will shared involvement improve our research? What if it doesn’t? In what ways will our research contribute to a more equitable world, even if it is challenging or hard for us or others to imagine, or seems over-simplified or arrogant to others? In other words, how do we act speculatively to embody action? I will also note that it was almost exactly two years ago, during the 2016 Congress of Social Sciences and Humanities at the University of Calgary that we developed our idea to pitch this article. We will be presenting together on a panel this year at the 2018 Congress in Regina, SK, alongside PhD Candidate and Filmmaker Cyrus Sundar Singh, in our panel: (re)Thinking Positionality in Digital Research: Ethics of Care in Practice, at the Canadian Communication Association meeting.